Would You Stay in a Pub? If you've never even imagined staying in an English pub, maybe it's time you reconsidered. Outdated ideas about pubs, like comparing them to bars, could be keeping you from finding some real gems. Today's pubs offer unique and uniquely British accommodations, conveniently located, moderately priced and usually serving pretty good food. Their rooms range from clean and basic to boutique hotel stylishness; their menus from English pub classics to genuine gastronomy. And for budget minded travelers, pub rooms often cost 30 to 50 percent less than equivalent quality hotel accommodation. Think about it - pubs originated as way-stations where travelers could find rest and refreshments (the clue is in the name, pub is short for public house). As many people seem to be drinking a lot less, enlightened English pub owners are beginning to return their premises to those origins. So don't be put off by the word pub — when the French call the same kind of accommodation an auberge it seems glamorous and welcoming. Start thinking about pub accommodations in that light and a whole new world of experience opens up. The following seven pubs are worth booking for your next trip to Britain. For purposes of comparison, the price of a classic burger is shown for all the pubs listed here — but most have menus that are more adventurous than that. The Orange Tree, located in the outer London borough of Richmond, Surrey, has been a fixture on Kew Road since the late 18th century. Its late Victorian brick and terracotta striped facade was added when the pub was rebuilt in the 1890s. Richmond's famous Orange Tree Theatre was founded in an upstairs room in 1971 and was located here until 1991. Today the pub sits right beside the new theater, handy for a pre-theater drink or meal. In 2014, the Orange Tree closed its doors, so that its owners, Young's Pubs, could give it a total makeover. When it reopened, several months later, a 13-room boutique hotel took over the space above the still popular pub. This west London location is very convenient for visitors who want to be within easy reach of Central London yet out of the hustle and bustle of the city. From Richmond Station, about 100 yards away, it's less than half an hour to London's West End on the District Line or 20 minutes to London Waterloo on mainline trains. It's also within walking distance of Richmond Park. Decor at the Orange Tree reflects the pub's location between Richmond Park and Kew Gardens, with botanical artwork and even some deer antlers. The 13 designer rooms range from a smallish boutique double to the stylish feature rooms. Some can be arranged for families or linked to adjoining rooms. Included are all the features you expect from a luxury hotels room — cable television, free wi-fi, posh tea and coffee making kit, hairdryer, safe, fridge and so on. What's not comparable are the prices which are substantially less than similar quality hotel rooms. At the height of the British sport and social season, in July 2017, prices range from £144 to £164 for bed and breakfast for two. In August prices dropped to £119 to £139. To put these prices in perspective, similar quality accommodation in Central London could cost £50 to £150 more per night. Pub-wise, the Orange Tree remains a traditional, and classy, pub. Bar snacks include wild boar and sage sausages and duck croquettes. Food is served throughout the day, from breakfast, through evening meals. Expect to spend £12 for a burger. Inside the seating is divided into bar seating, table seating, booths and a soft seating section. There's also a garden room suitable for parties. During Rugby matches, two large screens drop down and there's an outdoor BBQ with outdoor TV as well. On the down side, you can hear daytime traffic in rooms overlooking Kew Road and although the rooms are well soundproofed, during matches, Rugby fans in the pub can be boisterous. 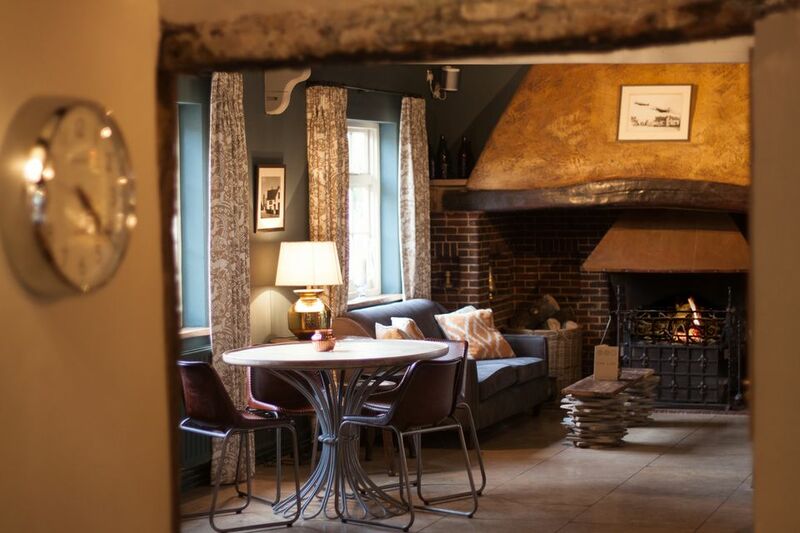 If a quiet stay in a country pub close to plenty of attractions is what you're after, the Barrow House, on The Street, in the tiny Kentish village of Egerton might be more your style. The white clapboard (or weatherboard to the British) village pub dates from 1576, built from timbers used in sailing ships and cob and straw plaster. It was once known as The George. The current owners, ex-London chef Dane Allchorne and is wife Sarah, renamed it after a prehistoric barrow that you can hike across the Kent Weald to visit. It has been modernized inside but retains much traditional 17th century oak timber framing and slate floors. The Barrow House is perfectly positioned for a few days of touring Kent, its oast houses, gardens, castles and family attractions. Top attractions within about 10 miles or less of the pub include the Leeds Castle (known as the loveliest castle in England); Sissinghurst Castle & Gardens; Pluckley (reputed to be the most haunted village in England), and the Ashford International Station for Eurostar and other trains to Continental Europe. The pub offers three guest rooms — two doubles and a twin room — each named for a type of Neolithic barrow: the Bowl, the Bell and The Disk. Rooms have large beds, modern bath or shower rooms and individual decor featuring British made fabrics and locally sourced art and photography. The views from all guest rooms, of the village and the valley, are glorious. Bed and breakfast rates for two range from £90 to £140 depending upon the season. The Barrow House operates as a restaurant with rooms. The ground floor areas include a traditional pub and two light and spacious dining rooms. One corner of the pub has a large stone hearth covered with signatures of the Canadian airmen who were based nearby during World War II. The seasonally changing menu includes small plates and sharing plates as well as sandwiches, starters and mains. It combines pub classics - bangers and mash, liver and onions - with more sophisticated offerings such as asparagus & mint risotto balls, roast apricot & orange blossom fool. Expect to spend £12 for a burger with chunky chips. Facing the long, monotonous drive from London to the ferry port at Dover first thing in the morning is daunting. Staying overnight before an early sailing makes a lot of sense but the hotels in the port are singularly uninspiring. Luckily, the White Cliffs Hotel and its Cliffe Pub & Kitchen is a comfortable alternative and the perfect stopover before leaving for a continental vacation. The pub on the High Street, St Margaret's at Cliffe, is only about 5 miles from the ferry port. It is a 16th century, white clapboard coaching in with 16 rooms in the main building, in mews cottages and old school rooms. Arrive early so you have time to explore the lovely medieval village surrounding the inn and the 12th century, Grade I Listed Church of St Margaret of Antioch across the street. It is believed to be the oldest aisled Norman church in Britain and is built on Saxon foundations. Inside, quirky, twisting corridors and narrow staircases lead to comfortably old fashioned rooms with down comforters, tea and coffee-making trays, hairdryer and other basic amenities. Bathrooms are a bit tired and in need of updating but clean and perfectly adequate for an overnight, pre-ferry stay. Double rooms in 2017 start at £130 with breakfast. If you are leaving for an early ferry, the hotel will supply a generous packed breakfast that includes breads, yogurts and fruit. The Cliffe has a small bar and several large, New England style dining rooms. The kitchen aims at gastropub fare. Reservations are recommended but on a weeknight in May the restaurant was not particularly busy though the pub was exceptionally noisy. The menu is interesting, competent and reasonably priced with an emphasis on locally caught seafood, shellfish and produce. The Cliffe doesn't do burgers, even at lunch, so we can't make a comparison with pub food elsewhere. They offer ham and mustard, cheese and onion and smoked salmon sandwiches at lunchtime for about £5. Dinner mains cost between £14 and £18. You'd hardly believe you're in London when you look out of the windows of this historic pub and and see grassy meadows, mature trees and, in good weather, sunbathers around a pond. The Windmill, another Young's pub, is embedded in Clapham Common, a 220 acre south London park. Yet it's a 10 minute walk to either Clapham Common or Clapham South Underground Stations. From either station it's under 15 minutes on the Northern Line to London Bridge Station and the center of town. The Windmill's 17th century facade camouflages a modern addition, which looks on first glance, like another building in the little residential enclave of Windmill Drive. It's actually a modern, 42-room, 3-star hotel. Rooms at the Windmill have boutique styling, with freestanding, roll top baths in the feature rooms. There's free wi-fi, flat-screen satellite television, and luxury tea and coffee making facilities. For the best views, ask for a Common View room with lovely views into the surrounding park. High season rates in July 2017 ranged from £165 for a twin room with breakfast for two up to £225 for a glamorous master suite with separate seating area. The pub itself is large with a good variety of beers on tap and a generous menu of traditional pub grub — burgers, gammon with egg and chips — as well as salads, lighter choices and vegetarian options. The pub serves breakfast, brunch, lunch and evening meals as well as bar snacks throughout the day. Expect to spend £9 for a classic cheese burger or £14 for a burger with all the trimmings — it's worth the extra for their fabulous triple-cooked chips. Spacious seating areas include the cool, dark, traditional pub interior, a soft seating area, a sunny conservatory with chandeliers and outdoor tables. Look for the glass panel on the floor next to the bar. It marks the original location of the windmill that gave the pub its name. Sheen is a posh, tucked away residential corner of Richmond and the Victoria, run by the small Jolly Fine Pub Group, is so tucked away amid suburban villas that you'll need a car and a satnav to find it. It's worth the effort for a very different experience. This is a cozy local gastropub with seven tidy guest rooms, a dark and woody traditional pub, a sunny conservatory and a sheltered beer garden. Be warned, though, try to avoid the end of the school day. The pub is beside a school and when school's out and parents arrive with their kids for the child-friendly garden, the decibel level can be deafening. The Victoria is easy to reach from Heathrow and a 15 minute walk along Fife Road to the Sheen Gate to Richmond Park. Rooms in converted stables at the Victoria are simple but spotless, colorful and modern.They are all doubles but one can be made up into a twin room and some can be fitted out with an extra cot or camp bed for a small child. They're equipped with high-speed, fibre-optic wi-fi, coffee makers and home made cookies. The year round rate, with continental breakfast for two is advertised at £135 but in fact varies from day to day and hovers around £100 during the summer months. The emphasis at the Victoria is on gastronomy with a slightly Mediterranean style - celeriac and apple soup, radicchio and pear salad, pan fried gnocchi, wild mushroom ravioli, rosemary roasted peach melba. The pub is listed in 2017 Michelin Guide and and has landed a diners choice award from Open Table. But it is still a pub after all and an Angus burger with those wonderful thrice-cooked chips is £12.50 for 5oz and £15.50 for 10 oz. Photo courtesy of JFP pubs. The Malt House is a spacious urban pub in West London less than half a mile from Chelsea Football Club at Stamford Bridge. If you think that means the pub will be busy and rooms will be at a premium during Chelsea matches, you'd be right. But most of the time, this is simply a lively, typically London place tucked into a hidden square five minutes from Fulham Broadway Underground Station. From the station there are District Line connections to Wimbledon and, through the Earl's Court Station to just about everywhere else. Catch the Number 14 bus route outside the Underground Station and you are on one of the most useful bus routes for tourists in London, going past: the Victoria and Albert, The Natural History Museum and the Science Museum; Harrods; the West End Theater District and Chinatown; and the British Museum. The pub looks Victorian, but actually it dates from the early 18th century, when it was called the Jolly Maltser. Completely refurbished in 2013, it has a traditional bar and several large rooms with tables and chairs, sofas and bar stools and windows overlooking a small, green square. There's a small outdoor area with picnic tables. For all its size, the Malt House has only six guest rooms — each large, modern and well equipped with coffee machines, free wi-fi, homemade cookies and flat screen televisions. Cots and rollaway beds for children are available on request. Standard doubles are fixed at £135 but may be higher when Chelsea is playing at home. The Malt House was named the Casual Dining Pub of the Year 2017 in the Casual Dining Pub and Restaurant Awards. They have several different menus, depending upon the time of day but their a la carte menu features hearty but ambitious dishes — seared bream fillets with curry laksa and pak choi, slow cooked pork cheeks with mash. Weekday afternoons there is a set menu of two courses for £10 or three for £12.50. Burgers with chips are available on the all day bar menu £12.50 for 5oz or £15.50 for 10oz. The Red Lion in East Haddon, Northamptonshire, is more a traditional country inn than a pub in the true sense. But as country inns go, it is a classic in golden stone with an impressive thatched roof and slate floors. The pub is well located for visiting Princess Diana's childhood home, Althorp, and Holdenby House - the remains of a once Royal palace and a Civil War prison for King Charles I. But you will definitely need a car and satellite navigation or GPS device to find it in its very rural setting. The seven rooms include a loft with a romantic looking freestanding bath on a platform next to the bed. It's marketed as a suite but it's really just a slightly larger room. Other rooms could be called quirky or dark and cramped depending upon your personal taste. The toilet/shower rooms are tiny. Rooms are quoted at £95 for one and £110 for two. Weekend rates are sometimes offered. As is common in the travel industry, the writer was provided with complimentary services (in this case, lunches) for review purposes. While it has not influenced this review, we believe in full disclosure of all potential conflicts of interest. What 5 UK Museums Are Worth a Side Trip?